How did your involvement with the 4449 and the ORHF begin? There’s a lot of history there, actually. It goes back about forty years. I started at the Norfolk Western before Amtrak existed. A lot of railroads all still ran passenger trains back then. In 1968, Ross Rowland’s High Iron Company was running excursions around New Jersey and Pennsylvania with a few smaller locomotives. Ross decided he wanted a larger engine and leased the Nickel Plate Road 759 from the Steamtown Foundation in Bellows Falls, Vermont. He moved the 759 to the N&W (old NKP) roundhouse in my hometown of Conneaut, Ohio for restoration and return to service. Soon after 759 arrived I went up to the roundhouse and just asked if they needed help, and volunteered. Back then I was young, single, and fancy free, and I would work on the 759 in my spare time. Being involved with that project eventually led to me being a part of the American Freedom Train. That’s the Bicentienal train that ran in 1975 and 1976. Don't get that confused with the one that ran in the 1940s and was just the Freedom Train. I left Ohio in 1974 to work on the restoration of the 4449 in Portland, then toured the entire country with the American Freedom Train. I was the “head dog" on the restoration team, and the engineer when we were on tour. The restoration and tour lasted from November of 1974 until June of 1977! This worked because I was one of the few people who was in a situation who could dedicate himself to runs. I did not have any children or an extended family to care for. This was also right around the same time as the State of Ohio abolished the full crew law. There was a protection claus in the repeal that all the men currently working could not be laid off and the jobs could only be eliminated by attrition. They didn’t mind me taking an extended leave of absence, because then they didn’t have to pay me. I was pretty much just in the right place, at the right time. And, as the old saying says, you can never go home again. I couldn’t stand to live in a small town after touring the whole United States. I discussed things with my wife and in 1978, we came to Portland and I got a job with the Southern Pacific. I picked them because I liked the Pacific Northwest, and this would put me closer to where the 4449 was being maintained. I had also interviewed with the Union Pacific and the Burlington Northern, but the Southern Pacific offered the best lifestyle. The next time the 4449 went on an excursion was May of 1981. We took it to Sacramento for the opening of the California State Railroad Museum. 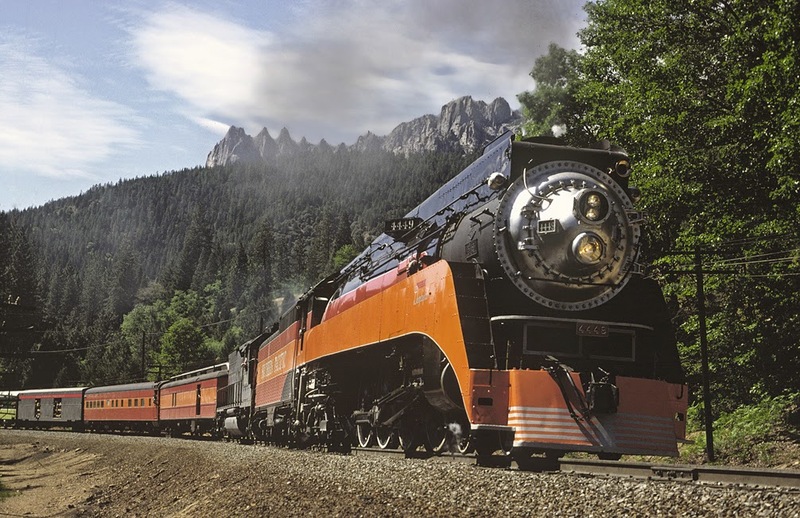 This was the beginning of its third career: It was with the Southern Pacific until 1957, then the Freedom Train from 1975-76, and it has been an excursion engine ever since 1981. As for how I got to be in charge, I like to say, I drew the short straw. I was the only one dumb enough to take on the management of the 4449 for its excursions. I was one of the few people who actually had the ability to dedicate enough time to restorations and operation. I worked for the Southern Pacific and and then the Union Pacific until I retired in 2003. With the merger of the SP and UP, the handwriting was on the wall that our longtime home in Brooklyn Roundhouse was going to come to an end. What, besides running and maintaining the 4449, does the ORHF do? The ORHF was created to establish a permanent home for the three steam locomotives owned by the City of Portland. That’s the 4449, the Spokane, Portland and Seattle 700, and the UP 197. They were all at the Brooklyn roundhouse, and the different organizations maintaining these locomotives all joined together and with the National Rail Historic Society and threw our hats into the ring to build new facility. The Oregon Rail Historic Center opened in 2012. Each group has a contract to maintain its locomotive, and we can’t be kicked out of this location. The locomotives are safe there. The 700 is out and running, unfortunately the 197 lacks manpower and money, but we help them when we can. When was the 4449 due for the 1472 inspection? It was due in 2013. The last excursion it ran was the Holiday Trains in 2012, then we dove into it. Was this the first time that you had overseen this process for the 4449, or for any other locomotive? Technically, yes. In 1999, I was on the committee to rewrite the FRA laws regarding the maintenance of operating steam locomotives. We got them passed in 2000 and had been working on them for three or four years prior to that. Steam locomotives don’t fall under the jurisdiction of state agencies, like stationary boilers do, and up until that point the FRA hadn’t been interested in changing regulations. All of us on that committee knew that the inspections were coming. One of the things that we got the FRA to agree to was a provision stating that locomotives which had been overhauled or repaired prior to 2000 could be grandfathered into the inspection schedule, providing that they kept very detailed records of their repairs. We kept that in mind when we worked on the 4449 in 1998, so we haven’t needed to do a 1472 inspection until now. In all that time, there were probably fewer than 300 days on which the 4449 was fired up. What was the condition of the 4449 at the time of the inspection? Were there any obvious problems, or minor repairs that you had put off until this time? We kept the engine in good shape. There weren’t any obvious problems, at least, none that affected its performance. There were a few repairs made back in the day by the SP that concerned me though, and there was one part of the firebox where the throat sheet transitions into the combustion chamber, that looked like it might be bad to me. We decided to cut all that out and replace it during the inspection. You have to remember, you can’t just think about whether or not a part functions now, but, will it function for another fifteen years? We have replaced anything we had concerns about.The hard part these days is finding the right supplies. Materials are harder to come by, and suppliers don’t always stock as much as they used to. We have all the parts we need now, though, and I spent today fitting the pieces up in the firebox. What is the first step in a 1472 inspection? The first step is looking at the boiler. You take out a sufficient number of tubes so that you are able to do a thorough inspection of the interior of the boiler. You have to make sure that everything is in good condition. There’s a caveat in the regulations that says you don’t have to take out all of the boiler tubes if they are in good condition. We only had to take about half of our tubes out. That was enough to do a thorough cleaning and inspection, and to see that everything was in good condition. There wasn’t a lot of scale or mud buildup. We are aggressive about water treatment, and the water supply up here around Portland is actually very pure. It’s not like the water down there in Texas [where you live]--I’ve seen that water. When you are doing this work in the boiler, and in the firebox, you would identify any problems or potential problems and start addressing them. We didn’t notice any, other than the throat sheet that I mentioned earlier. At this point in the inspection, we also used ultrasound testers to inspect the thickness of the boiler components. The FRA regulations state that the boiler has to have a minimum safety factor of 4 to 1--in other words, if the boiler is certified to run at 200 pounds of pressure, in theory all of its parts have to be able to withstand 800 pounds of pressure. I’m not a professional boilermaker, but I know enough about what I’m seeing, and I have enough experience to know when it is going to do the job. How much does a 1472 inspection cost? We probably have between 100-130,000 dollars sunk into it, but that’s without labor costs, and without finding any significant damage. The cost could go up dramatically for an organization that doesn’t have a lot of volunteer labor, or finds out that they have to do a lot of repairs. How much of the 1472 process is directly overseen by FRA agents? None. The regulations for steam engines work the same way they do for diesels. The FRA can only inspect an engine when it is offered for service. They can come out and see if it safe to operate, but they don’t tell you how to do your work or who has to do it for you. If you are reputable organization, though, you will include the FRA inspector as you go along and offer to have them come out as you go through the inspection process. You have to inform your regional inspector thirty days before you get ready to hydrostatically test the boiler, but it is his choice whether he comes out to see or not. This process isn’t rocket science. You have to learn some metallurgy and chemistry, a little bit from all the sciences but it’s not hard. Some people make it a lot harder than it has to be. We had involved the FRA during previous overhauls and repairs, and maintained a good relationship with them. They were confident that we wanted to do things right, but we weren’t above the law. How much of this work is done in your shops? Is any of it it outsourced to more specialized companies? We didn’t outsource anything. There is nothing in the FRA’s regulations that says a professional has to look at what you’re doing. It just says that it has to be up to accepted national or railroad standards. How much do volunteers participate in this inspection? The ORHF has no employees. It is all run by volunteers. Each group that works out of the ORHC is responsible for their own locomotive, though we do help each other out. We’re lucky to have good collection of people, and some of them have been here for a long time. There is something to be said for matching people up to work they can actually do, though. This work takes a lot of physical strength. If you can’t hold the tools in place to do the boiler work, that’s not safe, and it doesn’t get the job done. One of the issues with our collection of volunteers is, we’re all getting older! We have a few young people, but not enough. One of them was the son of one of my regular volunteers. He was very good at what he did, and eventually I helped him get a job at Grand Canyon. Now he’s up in Canada. Most of the young people come in interested, but then they discover girls, and have something else on their minds! There are lots more who just want to be engineer, and I tell them to go to school and learn the science first. What is the single most difficult part of this inspection? Why? All of the boiler work is nothing but hard work. There’s nothing easy about it. There’s no magic cure for it, and if you’re not willing to do hard work, not is going to happen. Doing the math and science is the easy parts. Those are known quantities. If you understand them, then it comes easier. Often, all it takes someone who has done the hard work to show you how. It’s not rocket science once you learn how to do it . I can show someone how to watch a new boiler tube rolling out, and then once it quits oscillating, walk away. Or beading tubes--it takes some practice to understand the right angle to bead them down, but it’s not hard once you get it. The only guy that needed to be shown that only once was the guy who went to the Grand Canyon. Steam engine rebuilds are strange, though, because for the first few months, a lot of stuff happens. All the parts come off, but then, all of a sudden, it will sit there and laugh at you for months. There are no visible changes that happen during this point, nothing to show that the inspection or overhaul is in progress. Some people loose interest and don’t stick around until it’s time to put it all back together. How long, from start to finish, does a 1472 inspection take? The first time we did an overhaul of the 4449, in 1974, we got it done in 126 days. That was with a full time crew in addition to a lot of volunteers, though. In 1984 we did an overhaul again, starting in June of 1983. We were done in ten months and went to the New Orleans’ World Fair. How long it takes to do a full 1472 will, again, depend on how much money and labor the organization in question has on hand. How far have you progressed in the inspection so far? Does the 4449 have a projected “finished” date? We have gotten to the point point where we are putting her back together. We’re looking at late summer to early fall to get it done, and we’re pretty confident about that. There’s no hard deadline. I’m getting old, and I never want to work under a deadline again. There is intense interest in heritage steam right. What plans do you have for the ORHF and the 4449 in the future? Unfortunately, we own the locomotives, but not the tracks. We are at the mercy of the parent railroads. Further down the road, there will be fewer people managing the railroads who personally care about steam excursions. All of the rail lines are at capacity with freight , and they are not interested in “playing” with steam locomotives. Even though we occasionally get chances to do things, it’s getting more and more difficult to get out on the main lines. These days we operate under Amtrak's operating authority with the railroads. But that brings its own challenges, because then the excursion train has to meet Amtrak standards. We can’t afford to keep and maintain passenger cars that meet those standards, so on those excursions we have the additional cost of renting and relocating the appropriate rolling stock. Over the years, we have seen many changes in the top level railroad management teams. Sometimes the new leader realizes what the steam operations can do for the railroads PR, and the next one might not. You have to realize that the next trip might be your last. You have to be aware of what's happening in the railroad industry as a whole, so you know when a trip might be approved. We are always grateful when our request is approved. When we get through the 1472 day inspection, we will see what the future holds. There are no plans for any operations right now. Hopefully we will see Doyle, his crew, and the 4449 on the road very soon! Special thanks to the people who helped arrange this interview. The views expressed herein do not necessarily reflect the views of the F-O-F blog.